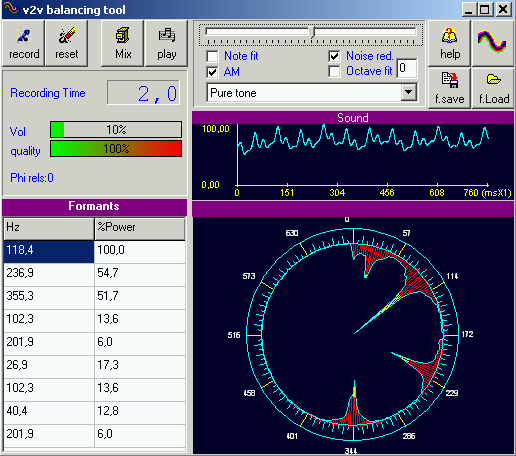 v2v performs voice analysis and generates voice2voice (v2v ) balancing tones. v2v is VoiceSync balancing tone generation technology, it uses a symmetric mirror composition of voice formants as a harmonizing sound, it therefore compensates excess tones reducing their power and increases weak ones raising them, the result is a familiar sound very close to nature environments that relaxes and increases your concentration. This program analyses voice calculating formants and displaying and accumulated radial spectrograph -your voice print-, filtering silence noise and low quality recordings. v2v tones are generated from calculated formants and can be mixed with your favorite music in CD, Mp3 or wav formats. Generated sound can be saved at required duration for future usage.